The Italian Grand Prix turns 89-years old this year. It’s been 50-years since one of the most tragic events of the Grand Prix and an American born racer won the Grand Prix. Those were the days when Ferrari was building its racing empire and Europe was still trying to recover from World Word II. The 1961 Grand Prix was one of the most famous races of the period and was the birth of the Formula F1 racing as we know it today. 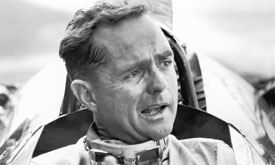 Phil Hill of Santa Monica, Ca was driving for team Ferrari, one of the first American drivers for Ferrari amongst the world’s best drivers and the world fastest race cars. This was a period in Formula racing before the development of the safety equipment and highly regulated race tracks. To be a race car driver and win races you had to have “Balls of Steel”. Only the best drivers survived to compete as the unlucky ones didn’t just loose the race, many died pushing the limits of the race cars of the period. 1961 Italian Grand Prix was the height of un-regulated racing and public outcry about racing safety. After the death of team Ferrari’s Count Wolfgang Von Trips at the ’61 Grand Prix, even the Pope chimed in about allowing this type of racing to continue. Phil Hill won the 1961 Italian Grand Prix, but the victory was bitter sweet. He was the first American to win the race and to this day no other American born racer has won the Italian Grand Prix. Winning the Grand Prix was the highest accomplishment a driver could attain, but at what cost? For those of you who don’t follow F1, the Italian Grand Prix was run at Autodromo di Monza on Sept, 11 and was won by team Red Bull driver Sebastian Vettel of Germany.